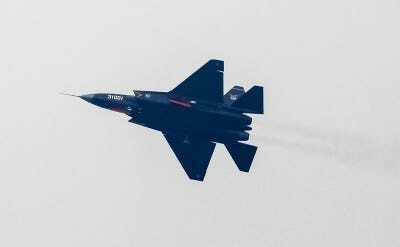 China unveiled its sophisticated new stealth fighter jet at an air show on Tuesday, in a show of muscle during a visit by U.S. President Barack Obama for an Asia-Pacific summit. China hopes the much-anticipated J-31 stealth aircraft, developed by the Aviation Industry Corp of China (Avic), the country’s top aircraft maker, will compete with U.S.-made hardware in export markets. The twin-engine fighter jet was unveiled at the China International Aviation and Aerospace Exhibition in the southern city of Zhuhai, an annual event at which China shows off its military technology, a Reuters witness said. The J-31 conducted a demonstration but was not put on display afterwards although a mock-up version was on show. An Avic spokesman declined to comment on any orders for the aircraft. “We were told not to do any promotion for the plane,” said the spokesman, Fu Mingyao. He did not elaborate. There are slated to be at least two more J-31 demonstrations at the show, Avic officials said. China hopes the J-31 will compete with the U.S.-made F-35 stealth aircraft as China works to strengthen its standing as an arms producer, according to China military watchers and state media reports. 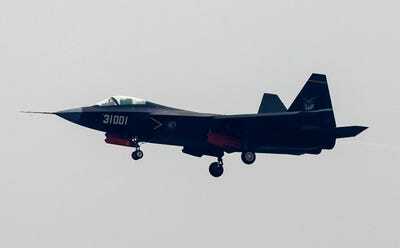 REUTERS/Alex LeeA J-31 stealth fighter of Chinese People’s Liberation Army Air Force is seen during a test flight ahead of the 10th China International Aviation and Aerospace Exhibition in Zhuhai, Guangdong province, November 10, 2014. More than 130 planes will attend the six-day air show starting on Tuesday, Xinhua News Agency reported. It said the aircraft would be particularly attractive to countries that are cut off from U.S. arms exports. The J-31 is about the same size as the F-35, the U.S. Department of Defence said in a report this year. Stealth aircraft are key for China’s air force to evolve from a mostly territorial air force to developing the ability to carry out both offensive and defensive operations, the Pentagon said in the report about developments in China’s military. The J-31 is China’s second domestically produced stealth fighter. Analysts say development of stealth aircraft enable China to better project its power as it takes on a more assertive stance in the East China and South China seas. President Xi Jinping has been pushing to strengthen China’s 2.3 million-strong armed forces. Obama, attending an Asia-Pacific Economic Cooperation forum meeting in Beijing, is due to meet Xi on Wednesday.